As requested by the ever-blinking wolf, here's Steph 5 wearing some of the Expansion items and, looking just a touch butch I think. 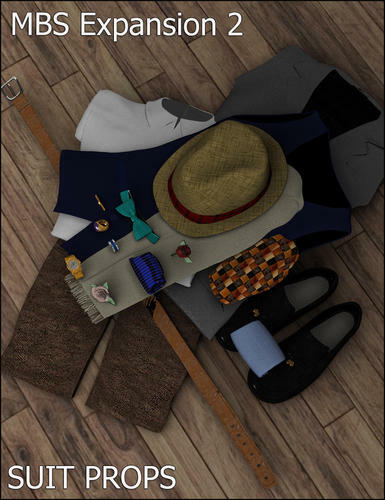 I'm including the straw hat texture shown to take the Fedora in a different direction. 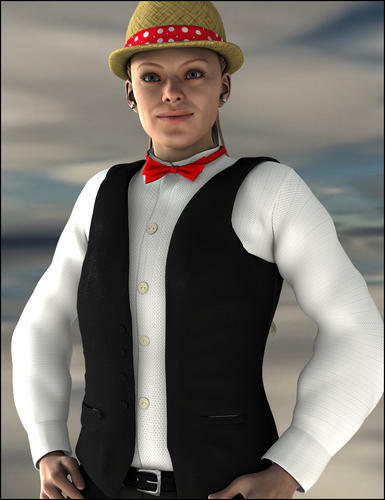 You can also see the belt and the bow tie as well as the waistcoat. The actual image is much bigger so click it to see. Another one - a classic look. 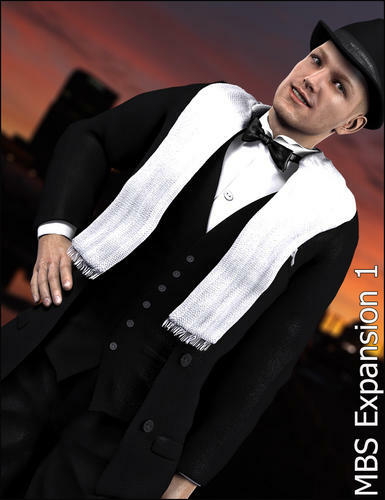 And here's one that shows what's in the Expansion, and another showing a couple of ways to wear the Ascot and another showing the briefcase. The actual pics are much bigger so do click them for details. If you added morphs for shortening the vest too, then you have a customer in me. 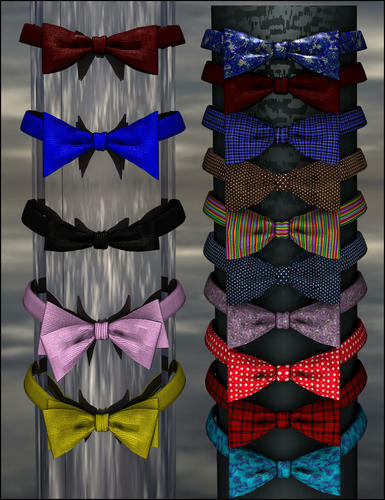 I've just done this one so you can see the different styles and some of the mats for the bow tie. 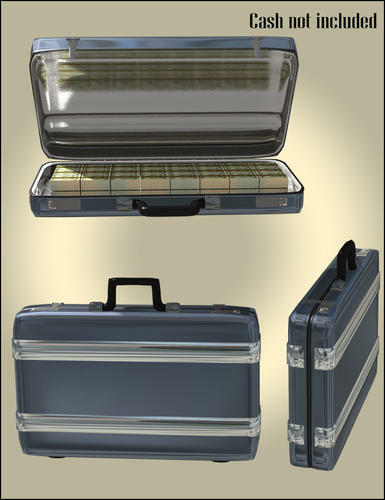 There's the equivalent of a substantial add-on texture set included with the product. See if you can get textures like in this picture... I think it's generic enough to not be copyright infringement. You can pretty well do that with it as it is. There's a broadcloth you can add your own diffuse to, or a grey flannel you can darken in the same way. It's pictured several times in this thread. There is a shirt texture with diagonal stripes. The bub is wearing it. It's tiled. Reduce the tiling and th stripes will be further apart. 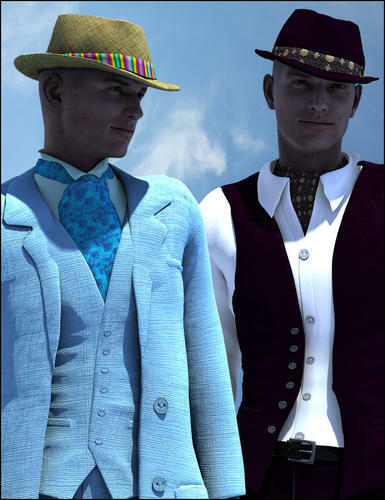 There are several striped ties included and you can reduce the tiling or use your own shaders. It's mostly done with tiled textures. My MachPack shader product has heaps of suitable textures in it. Only parts like the buttons and the inner fly (where there's a zipper) use texture maps, so this will be dead easy to tailor to your own tastes. 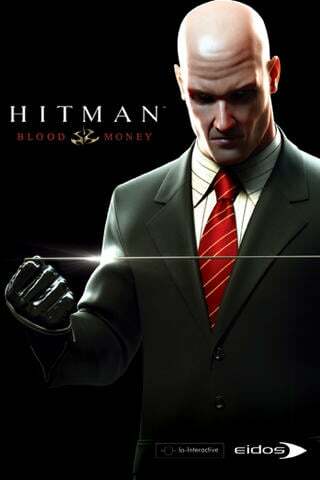 Would you be so kind as to try to emulate Norse Graphics pic of 007 as closely as possible? I would appreciate seeing a tight fitting grey flannel too. Sorry, but we are way, way too busy trying the get the expansion packs done to meet a deadline. 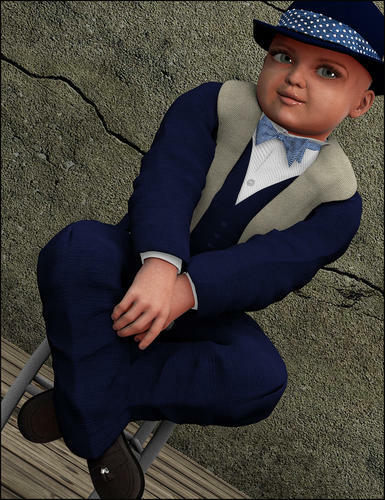 But you can imagine it very easily by looking at the running man in the tight navy suit and imagining him wearing the texture that's on the man in the Fedora with the briefcase. Just flick back a couple of pages in this thread. Here's a first quick look at some of the items in the next Expansion. 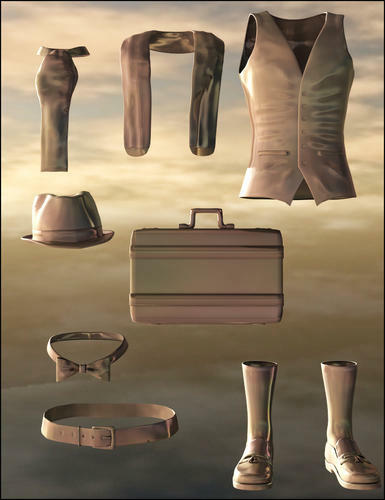 There are prop versions of all the clothing and some acceessories. I've quickly textured these with shaders, but I'll make a proper face for the watch, which is a very detailed rolex-style. 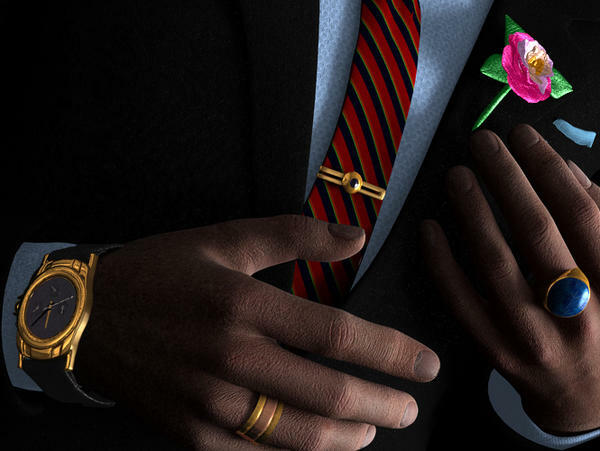 There are a couple of tie pins (only one is pictured) and two rings smart propped to various fingers. Also a couple of buttonhole flowers - this one and a rose bud. They are quickly textured with Silkessence here, but I would include fabric and real textures. And I understand. I look forward to the set and the expansion. Any idea on price and if there will be a sale on it as an introductory offer? We haven't talked about the price yet, but I'm sure there will be an intro sale. 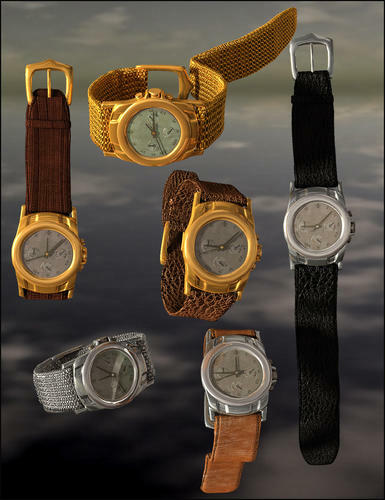 I've just done texturing these and I have to say this 3d Rolex is one of the best watches I've seen. 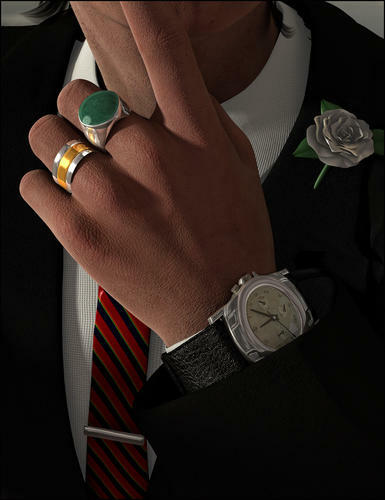 You can see the rings, the tie pins, the watch and one of buttonholes here. There's a much bigger version if you click on it. Please tell me there's cufflinks. 'Cause then I might explode from joy. You'll be relieved to know that self-detonation will not be necessary. There are no cuff links. They were deemed to be so much work that they would have raised the price of this prop set well beyond the range was want keep it within. He wears his watch over his shirt? I think you answered your own question - unless you really think a promo shot for the watch with it completely hidden would be a good idea. lol. Here's render showing most of what's in Expansion 2.